MuscleNerd of iPhone Dev-Team has just posted about an update of Redsn0w which fixes SMS and data issues that some of you may be having with iPhone OS 4 jailbreak. Official change log of Redsn0w 0.9.5b2 is as follows. For those JB app devs who experienced SMS or 3G data failures, the new 0.9.5b2 download at the bottom of this page should clear things up. You’ll need to do a fresh restore to stock 4.0b1 before applying the new beta redsn0w update. 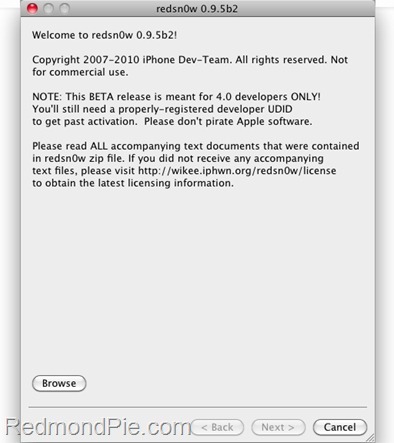 Instructions to jailbreak iPhone 3G on iPhone OS 4 Beta using Redsn0w 0.9.5b2 are exactly similar to the last release. Please read all the instructions posted here carefully before upgrading your phone to iPhone OS 4 Beta. Couldn't u just up from 3.1.3 to 4.0 then jailbreak it??? what about 3.1.3 new bootrom jailbreak? 3.1.3 jailbreak is really needed, so many people want it right now and you are releasing os 4 jailbreaks so why not 3.1.3. I have a 2g ipod touch mc model that came with 3.1.3 and it's impossible to jailbreak as of right now, please release the tools. i know all you guys in the jailbreaking and iphone development communities are trying to get the best of the iphone os4 beta version, but the 3.1.3 jb and unlock should be released first. cause i as many people do have a 3gs thats on 3.1.3 are stuck. i know youll are waiting for the perfect time to release this jb, but there are like 5 different jbs already announced, and atleast 2 are bound to be different. i just think that someone should release the 3.1.3 jb. totally agree 'rawe cakes'. Whats up guys?! how long r we really going to have to wait for this to free us? i do not think that apple programers are more skilled than our I-hackers out there. Could it be that Apple is noticing the ability of our ihackers like Dev team, Muscl nerd and Geo-Hots and is linking with them or making them offers they cant refuse to become traytors to us ihack supporters? they are not going to release it until the 4.0 FW is publicly released from apple because everyone will want to update to OS 4.0 to enable multitasking ETC so it would be a waste of their time and rescourses makeing a JB for OS 4.0 if no-ones going to update and also 4g get released end of june-july…..
can you explan who you jailbreak your iphone with new boot-rom. i don't wont sim unlocking only jailbreak it. Can you share on how you managed to jailbreak your iPhone 3GS 3.1.3 (is it by the way MC or … model?) as you mentioned that is jailbreakable. Still nothing for 3GS with new bootrom running iOS4 GM? Damn!!! any jailbreaks for the newbootrom on 3gs os 4.0 yet ??? need a jailbreak for 3gs 4.0 please release…..
Hello is it possiblle to jailbraek and unlock Baseband 05.13.04 on ios4 (3GS IPHONE) never jil broken yet. Which Software can do it?